Why not make your own chicken coop? Staffordshire pottery adds a great touch to any room. This page gives some great ideas for decorating. For those who just can't get enough of figures! 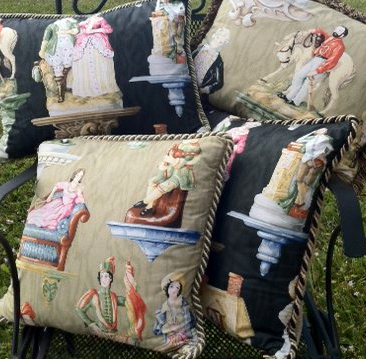 Staffordshire fabric, Clarence House, on down pillows. Black or beige background. 100 or 150 $US, depending on size. Like spaniels, hens come in 6 sizes. The largest hen is a whopping 16 inches and wouldn't fit in the picture. Graduated sets with matching colours are as rare as hens' teeth! These carpet balls, very decorative, were used in England for indoor bowling and were called carpet bowls. The white bowl called The Jack was the target. They came in several sizes, were made of stoneware, and it has been suggested they came from the Sunderland region. They came in wonderful colors and patterns and are usually arranged in a bowl or on a napkin ring between books in a library. Depending on size the price varies from $100 to $150 (for the 3+ inch size). These hunters come in the most beautiful pastel colors with lots of pink lustre to pickup sunlight or flickering fireplace flames. Wonderful for Florida fireplaces as well as colder neighborhoods, they are almost a foot tall, $550 each. If you have a mantle or piano or drum table that needs perking up, think about a set of Victorian spaniels, six pairs from 6" to 12" tall, can be arranged in a circle or in a line, and come in six colors, which you can see in the photo: red, white, black, black and white, and copper lustre. Each dog has a molded number on the base, number "1" the larget and "6" the smallest. P.O. Box 324,Old Westbury, New York 11568 USA.